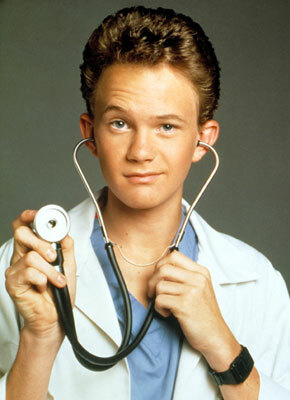 Doogie Howser | Run Thomas! Run! Firstly I want to apologise for using “less” in a couple of places in the blog yesterday where I should have used “fewer”. I did get an A in GCSE English so I feel I’ve let myself down a little bit. Tangential rant: I was unfortunate enough last night to catch an episode of “How I Met Your Mother”. It made me cross then, and I’m still feeling cross now. I have now watched 3 episodes of this frankly, execrable “comedy” show and felt the time has finally come to express myself fully on the matter. Now, I like a good American sitcom. MOR stuff like New Girl or Big Bang Theory are perfectly acceptable. I wouldn’t say they make me laugh but they act as comforting hamburger television for when you can’t be bothered turning your brain on. More positively I really like Scrubs and Arrested Development, both have sparkling, creative scripts and can be funny enough to force a laugh or two. So yeah, I’m not against the concept of American comedy. I am against How I Met Your Mother. I’m still struggling to pinpoint why it’s such a trainwreck of a show. The cast is decent enough – Willow from Buffy the Vampire Slayer and Doogie Hoswer, both awesome! yay! – but the script! Oh ye gods! The script! Leaden, grinding, miserable. There’s no sparkle, or verve, or wit. There’s flickerings of creativity in the format but it’s never fully exploited. The editing is poor, the camerawork poor even the audience laughtrack is poor. The entire thing is just so POOR. It ends up as half-watchable because of how poor it is. I was hating every minute of it, and yet I couldn’t drag myself away. it was like watching a man being slowly eaten by a leopard. The man being your childhood best friend and the leopard actually being a 16 foot inflatable Piers Morgan. I really, really, really don ‘t like it. Like wind. (TANGENT 2) I really dislike wind too. The blowy sort. Erm, the blowy outsidey sort. NOT THE BOTTOM SORT. It was a horrible swirly wind today, the sort that blows in your face whatever direction you’re moving in. Very, very depressing. What is it with wind? I mean, what’s the point of wind really? Before wind turbines, kites and wind surfing what was it actually useful for? Nothing, that’s what. It’s the lamest of all weathers. Yeah, pretty crap day really, what with my back still aching and… another…. medical complaint I won’t detail here that was rather unpleasant. I’m just about to watch the last episode of Sherlock so perhaps that’ll cheer me up. The acting was so bad in the last one I almost decided to give up on it, but I’m willing to give it one last chance. Did you see the last Sherlock? It had a guy in it with the biggest ears I’ve ever seen! I think he’s a comedy actor normally, but WOW the ears. If you get a chance do check them out on iPlayer. Make sure you’ve got a widescreen laptop though. Normally I wouldn’t be cruel about a physical deformity, but they really were ridiculous. He couldn’t act either, not just because I was staring at his ears all the time. I wonder if the two are related? I can’t think of any truly great actors with big ears. Leonard Nimoy perhaps, but then they were prosthetic…. Wow, bit of a ramble that. Sorry.